Michael Wilbon talks NBA, Cubs, and Tim Anderson with the guys, and Mark Giangreco jumps in for some fun as well. Waddle and Silvy preview the NFL Draft with Tim Hasselbeck, and the guys discuss last night's game winner from Damian Lillard. Tom Verducci has the latest on the Cubs and White Sox, and Waddle and Silvy wander into Waddle's World. Waddle and Silvy talk with Chicago Bears DE Akiem Hicks, and the guys crosstalk with Cramen and Jurko. The guys get the latest on the Cubs from Jesse Rogers, they preview the Draft with Trey Wingo, and bonus Mark Giangreco! The guys are joined by Peter King as he previews the NFL draft, and Mark Giangreco joins for some fun. Waddle and Silvy discuss Kris Bryant's struggles at the plate, and they recap the weekend in the Good, the Bad, and the Dirty. Adam Schefter joins Waddle and Silvy to preview the NFL Draft, and the guys take a trip to Waddle's World. Waddle and Silvy debate what the Cubs should do with Tyler Chatwood, and the guys crosstalk with Carmen and Jurko. President & CEO of the Blackhawks joins the guys to reminisce about Chet Coppock. Then the guys talk about Tim Andersons suspension. Mel Kiper joins the guys to preview next weeks NFL draft and who may be around for the Bears 1st pick. Then things get weird in Waddles World. The guys reminisce about the pioneer in Chicago media Chet Coppock was and they take callers stories about Chet. Then Giangreco joins to talk about his great times with Chet. The guys are joined by Karl Ravech to talk bat flips and brawls plus Cubs and White Sox. The guys take calls on the difference between celebrating and showing someone up. Jeff Dickerson joins the guys to discuss the passing of Chet Coppock and the release of the Bears schedule. Then its a wacky ride into Waddles World. The guys crosstalk with Carmen and Jurko. Then Ex-Cubs ace Carlos Zambrano joins them in studio to discuss his baseball come back with the Chicago Dogs. Barstool Big Cat joins the guys to discuss the Bears schedule, Krafts video release, Bryants struggle and more! Then they play My Wife or Radio Partner. The guys break down each game of the leaked Bears 2019 schedule and predict wins and losses. Then its yet another trip into Waddles World. The guys crosstalk with Carmen and Jurko. Then Loyola Mens BB Coach Porter Moser calls in to discuss his decision to stay at Loyola. The guys debate who would they rather have right now going forward: Kris Bryant or Eloy Jimenez. Then Jesse Rogers joins to talk about Darvishs start. Jeff Passan joins for a spirited conversation about baseball and Yu Darvish. Then they contemplate life in Would You Rather. The guys talk Warriors collapse, Boogie's injury and the Bulls with Nick Friedell. Then they take a trip into Waddle's World. The guys crosstalk with Carmen and Jurko. Then James Aducci the man who won the Tiger Woods Masters bet joins to tell his wild story. Waddle and Silvy are joined by Mike Greenberg. Nick Faldo on Tiger's win at the Masters. Todd Hollandsworth talks Cubs ahead of their series with the Marlins. The Good, the Bad, and the Dirty. Joe LaCava, Tiger Woods' caddy, talks about Tiger winning his fifth Masters. Plus, another trip inside Waddle's World. The guys crosstalk with Kap & Jurko and react to Tiger Woods' thrilling win at The Masters. Chris, Adam, and Jeff talk Cubs with Jesse Rogers and start the weekend with Mark Giangreco. Chris Bleck, Adam Abdalla, and Jeff Meller break down a Cubs win and a great start by Cole Hamels. Jeff Van Gundy joins Jeff Dickerson and Chris Bleck to preview the NBA Playoff, and the guys try to handle Waddle's World. Jurko discusses all of the Bears off-season moves with Jeff Dickerson. Jesse Rogers has the latest on the Cubs from Wrigley, and the guys debate whether or not the Bulls should bring back Derrick Rose. Barstool Big Cat joins the guys to give his hot takes on the Bulls, the Cubs, and The Masters, and the guys play What's At Steak. Michael Collins joins the guys with an update from The Masters, and the guys detour into Waddle's World. Waddle and Silvy react to the comments made by John Paxson at his end of the year press conference. Jesse Rogers has the latest on the Cubs from Wrigley, and Mark Giangreco jumps in for some fun as well. Michael Wilbon joins the guys to give his take on the Magic Johnson saga with the Lakers. Mark DeRosa joins the guys to give his take on the Cubs and the White Sox, and the guys veer into Waddle's World. Waddle and Silvy discussed the latest piece in Forbes about how much MLB teams are worth, and the guys crosstalk with Carmen and Jurko. Mike Tirico joins the guys from Augusta to preview "The Masters" and recap the National Championship. Jeff Passan joins the guys to talk Cubs and White Sox, and the guys play a little Would You Rather. Former Cubs catcher David Ross joins the guys to give his take on the team's season so far, and they take a trip to Waddle's World. Waddle and Silvy react to the National Championship Game and they crosstalk with Carmen and Jurko. Jesse Rogers joins the guys from Wrigley after a Cubs win, and the guys preview the National Championship with Mark Giangreco. The guys recap the Final Four and preview the National Championship with Dan Dakich, and the guys breakdown a Cubs Opening Day win. The guys recap the weekend in The Good, the Bad, and the Dirty, and the guys wander into Waddle's World. Waddle and Silvy talk to BJ Armstrong about Derrick Rose and the Bulls, and the guys crosstalk with Carmen and Jurko. The guys are joined by Jason Benetti to talk White Sox Opening Day and Mark Giangreco helps preview the weekend. Dave Revsine previews the Final Four and Jesse Rogers on another Cubs' debacle. Dan Plesac and Waddle's World. Crosstalk with Carmen and Jurko and angst over Cubs. Scott Van Pelt gives his thoughts on the Cubs, the Final Four, and The Masters. Jesse Rogers has the latest on the Cubs from Atlanta. The guys gauge Barstool Big Cat's level of concern with the Cubs, they get his Final Four thoughts, and talk about hedging bets. The guys talk to Pat Tomasulo about the Cubs and the great charity he's involved with, and the guys detour into Waddle's World. Waddle and Silvy recap another bullpen implosion by the Cubs, and the guys crosstalk with Carmen and Jurko. Comedian and die-hard Cubs fan Jeff Garlin joins the guys in the First Midwest bank Studio. The Mark Giangreco joins the fun. Waddle and Silvy talk Cubs and White Sox with Jon Sciambi, and they get Michael Wilbon's take on the Cubs slow start. Duke Men's Basketball Associate Head Coach Jon Scheyer joins the guys to discuss Zion Williamson's college career, and they wander into Waddle's World! Waddle and Silvy debate whether or not Joe Maddon should be held accountable for the Cubs slow start, and the guys crosstalk with Carmen and Jurko. Waddle and Silvy break down the recent struggles by the Cubs and White Sox. Jeff Passan jumps on with the guys to discuss the Cubs and White Sox, and they play a little Would You Rather. Jesse Rogers joins the guys as they try to solve the Cubs' problems, and the guys journey into Waddle's World. Waddle and Silvy breakdown another Cubs loss, and the guys crosstalk with Carmen and Jurko. Jesse has the latest on the Cubs after a bad weekend, and Mark Giangreco recaps the NCAA Tournament. Dan Dakich give his take on the action in the NCAA Tournament, and the guys recap the weekend in The Good, The Bad, and The Dirty. The guys discuss the bad start to the season for the Cubs bullpen and Yu Darvish, and the guys take a trip to Waddle's World. Waddle and Silvy break down a bad weekend for the Cubs, and a great weekend of college hoops. Plus, the guys crosstalk with Carmen and Jurko. The always entertaining Rick Sutcliffe joins the guys to talk Cubs, and they kick-off the weekend with Mark Giangreco! Michael Wilbon joins the guys to discuss the Jordan Howard trade, the NCAA Tournament, and whether or not Javy Baez is the face of the Cubs. The guys get a look at the NCAA Madness with Dave Revsine, and they take a stroll through Waddle's World. Waddle and Silvy discuss the Bears trading Jordan Howard to the Eagles, and the guys crosstalk with Carmen. Waddle and Silvy are joined by Loyola Men's Basketball Coach Porter Moser to preview the Sweet Sixteen. Barstool Big Cat discusses his big announcement with guys and gives them his best play of the NCAA Tournament, and they check in on the Bulls and their attempt to tank. Jesse joins Waddle and Silvy from Texas with the latest on the Cubs ahead of the game, and the guys steer the ship into Waddle's World. Cubs GM Jed Hoyer joins Waddle and Silvy to discuss the start of the season vs the Rangers. He talks about Joe Maddon, Ian Happ, and what worries him most abut the team. The guys preview the MLB season, and Mark Giangreco jumps in for some fun! Chuck Garfien previews the White Sox with the guys ahead of the new season, and they discuss the new NFL rules. Keith Law joins the guys to give his take on the Cubs and White Sox heading into the season, and the guys detour into Waddle's World. Waddle and Silvy debate whether or not this is Joe Maddon's last year with the Cubs, and they crosstalk with Carmen and Adam Amin. The guys discuss some of the new NFL rules proposed to the owners, and they discuss a new Derrick Rose documentary. Dan Wiederer joins the guys from the NFL Owners Meetings with an update on the Bears, and the guys play a little Would You Rather. Waddle and Silvy talk Cubs and Sox with Karl Ravech, and the guys wander into Waddle's World. Cubs Pitcher Cole Hamels joins the guys to preview the season and give an update on the team, and the guys crosstalk with Carmen and Jurko. Jesse Rogers has the latest on the Cubs ahead of Opening Day, and Mark Giangreco is back for some fun! Dan Dakich gives his take on the first week of the NCAA Tournament, and they recap the weekend with The Good, The Bad, and The Dirty. The guys discuss all of the changes the Cubs are implementing this season, and they take a trip to Waddle's World. Waddle and Silvy have a full breakdown of the first week of the NCAA Tournament, and the guys crosstalk with Carmen and Fred. Wilbon gives his take on the NCAA Tournament, Mike Trout, Eloy Jimenez, and what the Bulls are doing. Barstool Big Cat gives you his best plays for the opening weekend of the NCAA Tournament, and Dan Durkin gives his thoughts on the Bears moves so far. Jeff Passan gives his take on the deal between the White Sox and Eloy Jimenez, and the guys navigate through Waddle's World. Tom Waddle gets NCAA Bracket tips from Seth Greenberg, and he crosstalks with Carmen and Jurko. The Big Ten Network's Dave Revsine joins the guys to give his take on the NCAA Tournament, and the guys play a little Would You Rather. Jeff Goodman previews the NCAA Tournament with the guys, and they wander into Waddle's World. The guys dissect the NCAA Tournament Bracket, and they find out What's up Fred's can? Dan Dakich gives his take on the NCAA Tournament, and the guys recap the weekend in The Good, The Bad, and The Dirty. Louis Riddick gives his take on what the Bears have done in free agency, and the guys take a trip to Waddle's World. Waddle and Fred Huebner break down the NCAA Bracket and cross talk with Carmen and Jurko. Cubs President of Baseball Operations Theo Epstein joins the guys ahead of Waddle's World. The guys crosstalk with Carmen & Jurko and Cubs P Jon Lester joins W&S in spring training. NBA...peep show? Plus, Jason Heyward joins the guys at Cubs spring training. The guys are live in Arizona for Spring Training as they talk NFL Free Agency with Dan Orlovsky and then Jesse Rogers joins them to talk new MLB rules and Cubs. The guys are live in Arizona for Spring Training as they talk with Jason Wilde on swapping safeties w/the Packers. Then they take a trip into WaddleÃ¢`â„¢s World. The guys are live in Arizona for Spring Training as they crosstalk with Carmen and Jurko. Then they break down the Bears signing Ha Ha Clinton-Dix. Waddle is live from Spring Training as heÃ¢`â„¢s joined by Cubs SP Kyle Hendricks and then some silliness with Mark Giangreco. Waddle is in Arizona for Spring Training as he's joined Dan Wiederer to discuss the new Bears and potential new Bears. Then Wilbon joins to talk all things sports. Waddle live from Arizona breaks down all the latest from the NFL free agency as the new year commences. Then it's another trip into Waddle's World. Live from Spring Training in Arizona Waddle crosstalks wit Carmen and Jurko. Then Jesse Rogers joins to discuss the latest from Spring Training. Peter King joins and gives you the latest from the NFL Free agency. Waddle and Silvy have the latest info on all the Hot NFL Chatter around the league, they discuss what the Bears may do with Jordan Howard, and they head into Waddle's World. Waddle and Silvy discuss all of the NFL free agency news with Mark Giangreco. Waddle and Silvy debate the merits of the Bears signing Le'Veon Bell, and the guys recap the weekend with the Good, the Bad, and the Dirty. Field Yates gives his take on all of the NFL moves that as been made today, and the guys take a trip to Waddle's World. Waddle and Silvy discuss all of the NFL news as free agency begins with the legal tampering period. The guys also crosstalk with Carmen and Jurko. The guys keep track of all of the Hot NFL Chatter surrounding Antonio Brown, and they kick off the weekend with Mark Giangreco. Dan Wiederer joins the guys to preview NFL free agency and talk Bears, and they talk Duke basketball with associate head coach Jon Scheyer. Ryen Russillo joins the guys in-studio to talk college basketball and the NBA, and the guys detour into Waddle's World. Waddle and Silvy react to all of the hot NFL chatter happening today, and the guys crosstalk with Carmen and Jurko. Dan Plesac joins the guys to talk Cubs and White Sox, and the guys debate the merits of trading Jordan Howard. Barstool Big Cat joins the guys to discuss LeBron passing MJ in scoring, Jordan Howard, and a big Bulls win from last night. Adam Schefter discusses Jordan Howard's future with the Bears and other NFL free agency stories, and the guys wander into Waddle's World. Waddle and Silvy discuss the report from Adam Schefter about Jordan Howard, and the guys crosstalk with Carmen and Jurko. Michael Wilbon joins the guys to discuss the Bulls and the NBA, and Mark Giangreco jumps in for some fun as well. Waddle and Silvy discuss the new kicker that the Bears have signed, and they play a round of My Wife or Radio Partner. Marty Smith joins the guys to talk Duke basketball and Kyler Murray, and the guys head into Waddle's World. Waddle and Silvy discuss Jimmy Butler and where he ranks among the best Bulls since Michael Jordan. The guys also crosstalk with Carmen and Jurko. Waddle and Silvy debate which team, the Cubs or the Bears, are poised to win the next Chicago championship. Scott Van Pelt joins the guys to give his take on Kyler Murray, LeBron, and Jay Cutler, and the guys play a little Would You Rather. Nick Friedell joins the guys to give his take on the Bulls and the Warriors, and the guys take a trip to Waddle's World. 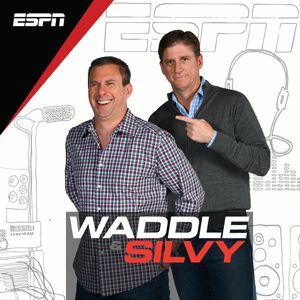 Waddle and Silvy debate who they would bet to win a championship first- the Bears or the Cubs. The guys also crosstalk with Jurko. Waddle and Silvy talk Bulls and the direction of the organization, and Mark Giangreco jumps in to recap Very Cavallari. Jesse has the latest on the Cubs from Arizona, and the guys recap the weekend with The Good, the Bad, and the Dirty. Waddle and Silvy discuss the latest interview with Bulls President and COO Michael Reinsdorf, and Waddle is back to take us to Waddle's World. Waddle and Silvy break down the good and bad from the Bulls weekend, and the guys crosstalk with Carmen and Jurko. The guys hear from Kris Bryant who joined them earlier in the show, and they find out What's Up Fred's Can. Barstool Big Cat joins the guys to tell some stories from the Combine and give his take on Bryce Harper signing, and the guys tell you what they are watching for this weekend. Louis Riddick joins the guys from the NFL Combine to give his thoughts on the Bears, and the guys detour into Waddle's World. Chicago Cub Kris Bryant joins Silvy and Fred Huebner to discuss his health and his thoughts on the team so far. The guys also crosstalk with Carmen and Jurko. Silvy and Pat Boyle discuss the Phillies signing Bryce Harper, and they play Taller or Shorter than Kyler Murray. Field Yates looks at what the Bears can gain from the combine this week, and the guys discuss their favorite broadcasters. Jeff Passan takes the guys inside the Bryce Harper deal, Todd McShay breaks down the prospects at the NFL Combine, and the guys head into Waddle's World. Silvy and Pat Boyle react to the Bryce Harper news, and the guys crosstalk with Carmen and Jurko. Silvy and Pat Boyle are joined by Michael Wilbon and Mark Giangreco. Mark Teixeira talks Cubs and White Sox with the guys, and the guys try to solve the Bears kicking problem. Dan Wiederer has the latest on the Bears from the NFL Combine, and Pat Boyle steers the ship for Waddle's World. Silvy and Pat Boyle hear from Ryan Pace and Matt Nagy as the NFL Combine begins, and the guys crosstalk with Carmen and Jurko. Waddle and Silvy discuss all of the news from the Bears today, and Mark Giangreco joins the guys for some fun. Jesse Rogers reports from Cubs camp after Yu Darvish's first start, and the guys wander into Waddle's World. Waddle and Silvy discuss the Bears news surrounding Kyle Long and Robbie Gould, and the guys crosstalk with Carmen and Jurko. Mike Greenberg joins the guys to give his take on Zion Williamson and the NBA Draft, and Mark Giangreco jumps in for some fun as well. Kendall Gill joins the guys to discuss the Bulls' recent success, and the guys recap the weekend with the Good, the Bad, and the Dirty. Jesse Rogers has the latest on the Cubs as Spring Training games have begun, and the guys take a trip to Waddle's World. Waddle and Silvy recap the weekend for the Bulls that resulted in wins, and the guys crosstalk with Carmen and Jurko. Silvy and Fred Huebner react to the news that the Bears will cut Cody Parkey, and they kick-off the weekend with Mark Giangreco. Pat Boyle talks Blackhawks with the guys, and they react to the news that the Bears will release Cody Parkey. The guys check in with Jesse Rogers at the Manny Machado press conference, they try to handle Waddle's World, and they check out What's Up Fred's Can. Silvy and Fred Huebner discuss Manny Machado's comments to the media after signing with the Padres, and the guys crosstalk with Carmen and Jurko. Carlos Boozer joins the guys to give his take on Zion Williamson and the Bulls, and the guys get an update on Williamson's health. Barstool Big Cat talks about Duke and Zion Williamson, and the guys enter the hot take machine in Gush or Crush. Silvy reacts to Manny Machado signing with the Padres, and the guys wander into Waddle's World. Waddle and Silvy react to Zion Williamson's injury with Dan Dakich, the guys also crosstalk with Carmen and Jurko. Michael Wilbon and Mark Giangreco give their take on Manny Machado signing with the Padres. Waddle, Meller, and Abdalla further break down the White Sox missing out on Manny Machado, and Dan Le Batard jumps on to discuss his new feature on ESPN. Cubs pitcher Cole Hamels joins Waddle to discuss Spring Training so far. Then Waddle, Meller, and Abdalla journey to Waddle's World. Tom Waddle talks with Dave Revsine about the White Sox, Zion Williamson, and Big Ten Basketball. Waddle also crosstalks with Carmen and Jurko. The guys talk to Jeff Passan about Manny Machado signing with the Padres, and can Pat Boyle do 40 push-ups? Chuck Garfien reacts to Manny Machado signing with the Padres, and the guys hear from Sox fans as well. Jeff Passan joins the guys to give his take on the Machado deal, and the guys take a trip to Waddle's World. Manny Machado has picked the Padres and Tom Waddle and Pat Boyle react to the news. The guys also crosstalk with Carmen and Jurko. Waddle gets a visit from Jesse Rogers down in Arizona as they dissect Tom RickettsÃ¢`â„¢ comments to the media today. Plus Mark Giangreco joins to recap the weekend. Hour3: Waddle and Kap break down all the action from NBAÃ¢`â„¢s All-Star Weekend with Nick Friedell. Then they recap the weekend in The Good, The Bad and The Dirty. Waddle and Kap discuss Tom RickettsÃ¢`â„¢ statements today and then dive into WaddleÃ¢`â„¢s World. Hour 1: Waddle crosstalks w/Carmen and Jurko as they discuss and replay chunks from Tom RickettsÃ¢`â„¢ press conference today. The guys hear from Addison Russell who addressed the media today, and they kick-off the weekend with Mark Giangreco. Jesse Rogers has the latest on the Cubs and gives his thoughts on Addison Russell, and the guys talk NBA prospects with Seth Greenberg. The guys check in on the White Sox with Jason Benetti, and they head into Waddle's World for some fun. Waddle and Silvy react to the Addison Russell press conference, the guys also crosstalk with Carmen and Jurko. The guys touch on the business side of the team with Crane Kenney in the second part of their interview, and they read the best VDay sports poems. Barstool Big Cat give his thoughts on the Cubs new network and Duke, and the guys turn on the hot take machine in Gush or Crush. Cubs' President of Business Operations Crane Kenney joins the guys to detail the new Cubs network, and the guys navigate through Waddle's World. Waddle and Silvy read some Chicago-centric Valentine's Day poems, and they guys crosstalk with Waddle and Silvy. Michael Wilbon and Mark Giangreco give their thoughts on the White Sox and the new Cubs network. Waddle and Silvy get baseball reports from both sides of town as they hear from Jesse Rogers on the Cubs and Check Garfien on the Sox. Dan Dakich joins the guys to give his take on Zion Williamson and the Bulls, and the guys detour into Waddle's World. Waddle and Silvy hear from White Sox GM Rick Hahn as he meets the media, and the guys discuss the new Cubs network announced today. Waddle and Silvy hear from Joe Maddon and Theo Epstein as they met the media today, and they get Kap's opinion on the team as well. Eddie Olczyk joins the guys to break down the surging Blackhawks, and the guys get the latest on the Cubs from Jesse Rogers. Waddle and Silvy hear from Theo Epstein who met the media today for his State of the Cubs address along with Jed Hoyer and Joe Maddon, and the guys head to Waddle's World. Waddle and Silvy talk to Jeff Goodman who gives his thoughts on the top NBA prospects, and the guys crosstalk with Carmen and Jurko. Waddle and Silvy talk Bulls with Malika Andrews, and Mark Giangreco gives his take on the AAF and the lack of MLB signings.